Trinity Kronk was already thinking about pursuing research work on her planned path to medical school when she pulled out her neuroscience textbook on a flight from her native Pittsburgh. Her seatmate wondered, correctly, if Kronk was an Emory College student. Then, the woman next to her surprised her with an unexpected offer: She was a post-doctoral fellow doing research at the School of Medicine’s Renal Division and would be possibly interested in having another student work with her. In May, a year after that chance meeting at 30,000 feet, Kronk graduated with a degree in behavioral biology and neuroscience, after working on a project investigating the role of cytokine-mediated transactivation of the mineralocorticoid receptor (MR) in hypertension. Clinical studies demonstrate that cytokines, such as interleukin-6 (IL-6), are increased in hypertension patients and in in vivo research, loss of this cytokine prevents some forms of experimental hypertension. 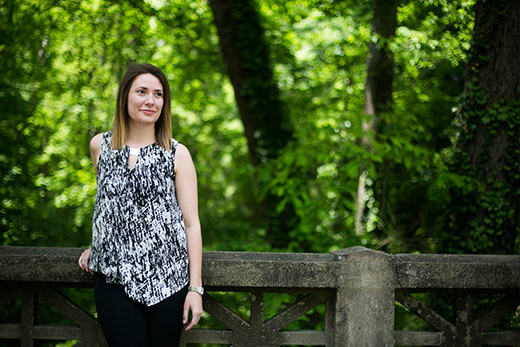 She has been integral in the discoveries that her mentor Brandi Wynne, the post-doctoral fellow on that plane ride, thinks will end up in at least two peer-reviewed publications soon, on an issue affecting a quarter of all American adults: high blood pressure. Wynne’s research focuses on answering why some people with high blood pressure do not have elevated levels of the hormones that tell the body to reabsorb sodium, yet still continue to retain sodium and water. Increased sodium retention can lead to increased blood volume, which increases blood pressure. That some people suffered from high blood pressure without the high levels of that hormone indicated that something else was causing activation of the aldosterone receptor, the MR, and promoting hypertension. Kronk used tools such as "tagging" the MR with green fluorescent protein (isolated from jellyfish) and then inducing cells to take up this modified DNA. At that point, Kronk could use confocal imaging to determine if treating the cells with IL-6 would cause movement of the MR into the nucleus. This is the first step in activation of this receptor. While working on this project, Kronk’s reading caused her to notice that very little evidence demonstrated that the receptor for IL-6, IL-6 receptor alpha, was present in the kidney. Until this point, only studies investigating cell culture models of the kidney had demonstrated genetic evidence of the receptor; however, none had definitively determined its location in the kidney. This became the focus of Kronk’s SIRE grant. Using physiological hormones that would be present in the kidney, Kronk demonstrated that these hormones could alter IL-6 Rα levels. Even better, Kronk hopes the discoveries will lead to a better understanding of the drugs needed to treat high blood pressure. Developing drugs to block the receptor activation in the kidney, for instance, would be a new way to control an all-too common ailment. That care could be especially applicable for the heart attack and stroke patients Kronk saw in her three years working for Emory EMS, and perhaps future patients once she becomes a physician. Kronk says she found her way to medicine after shadowing an OB-GYN in high school, following a childhood dreaming of becoming a veterinarian. Her time at Emory has been about preparing to be a doctor, with time spent as an advanced EMT and leadership in Emory’s “What’s In A Doctor’s Bag” chapter, designed to expose children to medical care. She has also helped provide medical and dental care in Central America and served as a volunteer at Children’s Healthcare of Atlanta. But her research and discoveries have broadened her path for the future. Her plan is to earn an MD and PhD so she can do both research and clinical work. She is taking this year off from her studies, working as a research assistant at Emory in the Renal Department and trying to decide if she remains committed to becoming an OB-GYN. But she’s not opposed to becoming a nephrologist or cardiologist and further specializing in an area where she’s already left a mark.